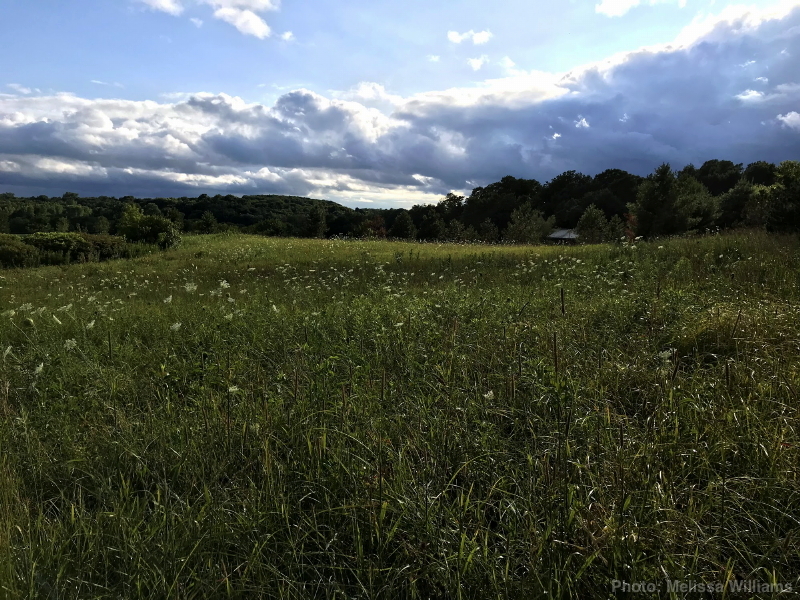 I’ve written about our frustration over waiting for our hay-field to get cut before the weeds had a chance to go to seed. 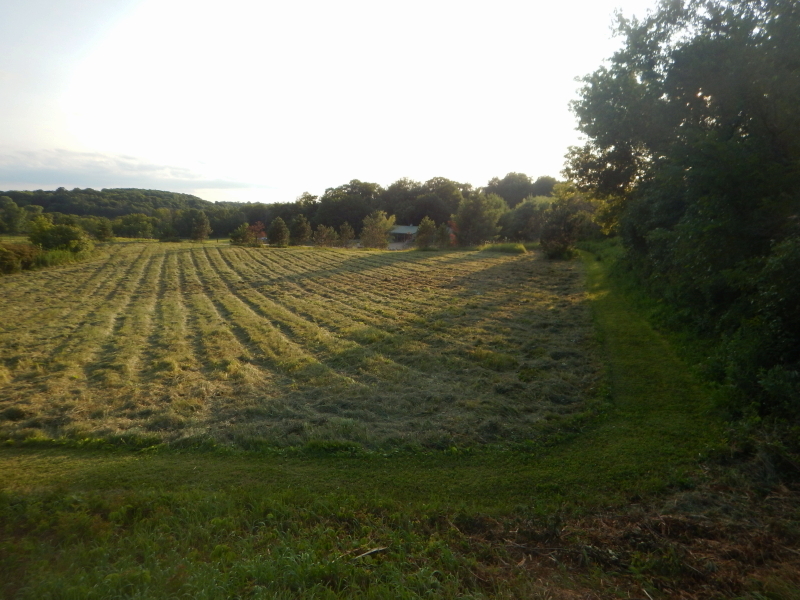 Now that those fields have been cropped clean, my attention turned to knocking down the weeds and troublesome invasive plants growing rampant on the other side of our driveway. When I finished mowing, I took a picture. A day later, Cyndie showed me a photo album our friend Melissa shared with pictures from her visit, days earlier. I couldn’t resist grabbing Mel’s gorgeous image from a similar vantage point, taken before I had mowed. It causes me a little regret, because the visual of the before/after doesn’t necessarily look like an improvement. There are a few butterflies that aren’t very happy with me, as well. I’m hoping they will find their way over to Cyndie’s other gardens where she has offerings that are desirable to both us and them. As much as we love the natural look of our uncut field on the north side of our driveway, it contains problem plants that we don’t want migrating across to the hay-field we have been working to improve for years. One future possibility we are considering is doing a prairie restoration. That process starts with a prescribed burn, which makes it a production that we can’t accomplish all on our own and will need a fair amount of planning and follow through to bring to fruition. It doesn’t mean it can’t be done, but it is involved enough that it won’t just occur on a whim. Until then, we will continue to periodically cut down the growth as a way of controlling the weeds from completely taking over. I certainly understand the dilemma. I have even spent some time carefully mowing around some milkweed to help out the Monarchs. But have been ruthless with many of weeds trying to get the fields to at least look nicer. My main problem is kudzu and that is an never ending battle. I have just recently gotten a small start of the kudzu patch across the road from the house. Good for you to preserve some milkweed. I’m happy to NOT be managing kudzu among the other tenacious invaders that keep showing up. Wouldn’t that second field make a good pasture for a small herd of sheep or goats? I think goats would be cool because you could temporarily pen them in the areas around your trails where you want to get rid of invasives that they are said to like. Your are strong with inspiration. More animals, though they would be nice, are beyond our capacity to manage at this time. First among many tasks would be establishing adequate fencing and making water available. That area isn’t well situated to convenient access for water. Ah! John. Collateral damage…feels a little like my life at the moment. Sometimes it is hard to justify how something beautiful may not be beneficial. But this is life and I have seen moments of this. Thank you, Lorrie. Summer is delivering its very best, much to our pleasure. We are well. Thanks for checking in. Sending you hopes of insight and balance on your journey!